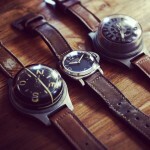 Chapter XI.I is featuring compasses from Guido Panerai & Figlio. Five different models are featured from page 1320 to 1333. Three with “Radiomir”, two with “Luminor”. 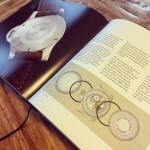 Chapter XI.II is featuring depth gauges from Guido Panerai & Figlio, similiar to the instrument which can be seen in the photo. Ten different models are featured from page 1334 to 1367. 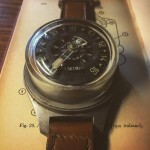 Six with “Radiomir”, aimed to 7, 30, 35 (2 versions: adjustable and non-adjustable dial), 50 and 60 meters. Four with “Luminor”, aimed to 7, 15, 16, 30 and 40 meters. Phillips will feature a very rare Ref. 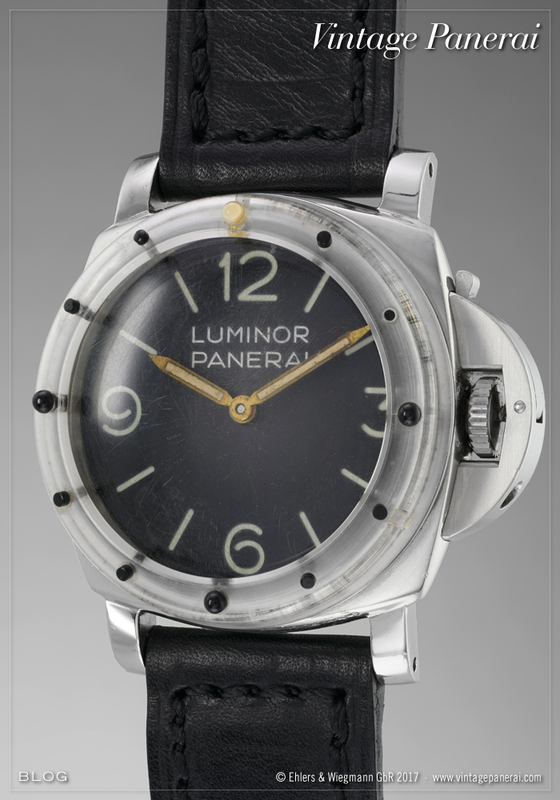 6152/1 “Luminor Panerai” in their Geneva Watch Auction: SIX, which will be held on Sunday, 12 November 2017. It is one of very few existing Ref. 6152/1 watches with a rotating plexi bezel. Until today we have just four 6152/1 watches in our records that still feature such an additional rotating bezel – and one of them is the watch up for auction. The Rolex movement of the watch with “Luminor Panerai” dial is a typical Cal. 618 / Type 4 version with incabloc shock protection and 17 jewels. The watch came from the descendants of Admiral Gino Birindelli (1911 – 2008) and was auctioned for the first time only a few years ago at Sotheby’s in May 2014. Further info on this watch (lot 209) can be found here. During the 2nd world war, Birindelli was a SLC pilot in the very early missions of the Mezzi d’Assalto against Alexandria (G.A.1) and Gibraltar (B.G.1 and B.G.2) in 1940. He was in fact the first SLC pilot who entered an enemy harbor with his device in the night of 30 October 1940, for which he was awarded with the gold medal for galantry at war (M.O.V.M.). Birindelli survived being a prisoner of war from October 1940 to March 1944. After the 2nd world war his career in the Italian Navy continued and became quite unique. 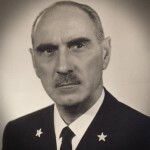 Birindelli was commander of the Incursori (COMSUBIN) from 26 September 1948 to 30 April 1950, once again from 1 May 1954 to 5 June 1956. He was promoted to Rear Admiral in 1959, headed the I Divisione Navale as well as the fleet command (Comandante in Capo della Squadra Navale). Gino Birindelli headed the Allied naval forces in southern Europe before he retired in December 1973 in the rank of Ammiraglio di Squadra. Read more on Admiral Gino Birindelli here. The watch of Admiral Gino Birindelli and the unique story behind his career can be read in our book “The References” 1950’s-1960’s (chapter VIII.II, page 1006 to 1043). What brought about the demand for new and improved diver’s watches in Italy after the end of the Second World War? The answer to this question is inextricably intertwined with the history of the maritime special units, whose transformation from the Mezzi d’Assalto of the Decima MAS to the COMSUBIN took many years. 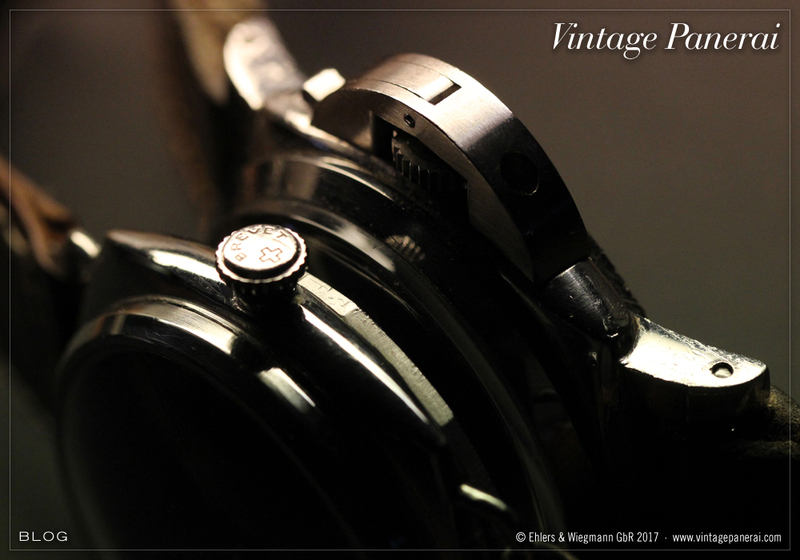 The evolution of Vintage Panerai watches from Guido Panerai & Figlio from the 1930’s to the 1960’s can be symbolized in a photo like the one shown here: from a cushion shaped case with soldered lugs and an onion shaped crown to a much stronger, massive case with solid lugs and the legendary crown-protecting device. The early References 2533 (chapter I) and 3646 (chapter II) are explained and with rich reference to several variants by their number groups in the first volume “The References” 1930’s-1940’s. This overview is complimented by the legendary Mare Nostrum chronograph (chapter III), rare compasses (chapter IV) used in the Second World War and some of the few straps and buckles which rarely survived after more than 70 years (chapter V). 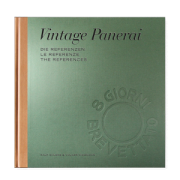 Find information about the content of our book “The References” 1930’s-1940’s by using the “browse by tag” function. 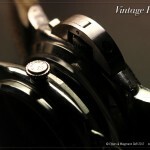 The tag 696 is connected with all stories published about the first volume: watches, history, instruments and straps of the 1930’s-1940’s. “The References” 1950’s-1960’s features numerous images and historic information on Vintage Panerai watches from the 1950’s to 1960’s. The References 6152 (chapter VI) and 6154 (chapter VII), are followed by Reference 6152/1 with the famous crown-protecting device are explained in detail and many variations in chapter VIII. Followed by the Reference GPF 2/56 with Angelus movement (chapter IX), “The References” 1950’s-1960’s features in chapter X the Modified References 3646, Transitional 3646 and Modified Reference 6152/1. Chapter XI is about compasses and depth gauges, followed by the last chapter XII, an overview of the straps and buckles used on watches and instruments from Guido Panerai & Figlio in this era. Find information about the content of our book “The References” 1950’s-1960’s by using the “browse by tag” function. 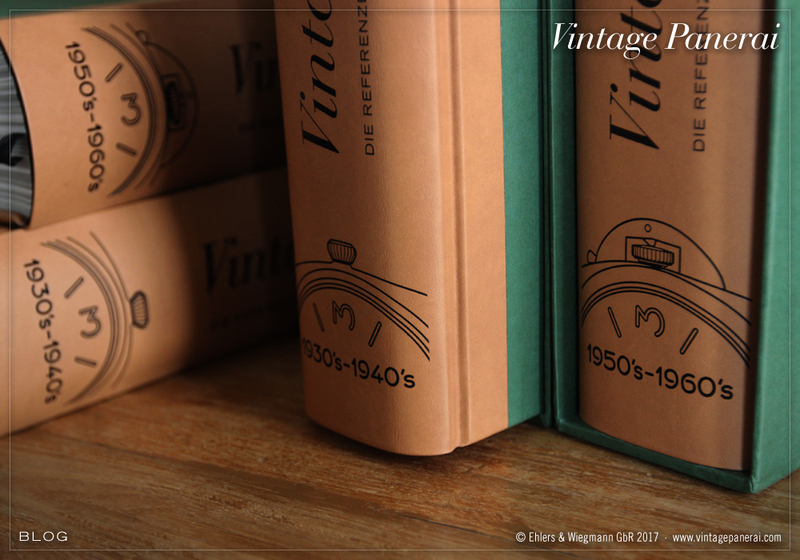 The tag 1392 is connected with all stories published about the second volume: watches, history, instruments and straps of the 1950’s-1960’s. The spine of our both “The References” books are embossed with the symbols of evolution, just like the first photo above shows it at a glance: from a cusion shaped case with soldered lugs and an onion shaped crown (“The References” 1930’s-1940’s) to a much stronger, massive case with solid lugs and the legendary crown-protecting device (“The References” 1950’s-1960’s). Visit our bookstore and enjoy reading soon! Luigi Durand de la Penne was one of the famous SLC pilots of the Mezzi d’Assalto who wrote naval history in the Second World War. Luigi Durand de la Penne was born in Genoa, where he also died (11 February 1914 – 17 January 1992). He graduated from the Naval Academy in Livorno in 1934. He was one of the first crewmen of the 1° Gruppo Sommergibili who realized Teseo Tesei’s and Elios Toschi’s idea of a new, secret weapon in La Spezia: The SLC. At the training base Bocca di Serchio he was a member of the legendary group which founded the famous „Spirito del Serchio“. The first remarkable milestones of his naval career was the rescue action of the transport submarine for SLC devices, the Iride: On 22 August 1940, in the Gulf of Bomba, the Iride was sunk by a torpedo released by a British Swordfish bomber. The air attack happened during an exercise, in shallow water, when four SLC teams were around, including the officers Teseo Tesei, Gino Birindelli and Luigi Durand de la Penne. They started an immediate rescue action. Of the 12 Iride crewmen who survived, two died during an unsuccessful attempt to surface, nine were retrieved alive (two of them died soon, due to wounds), and one was too shocked to leave the sunken submarine. 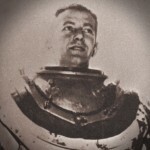 Luigi Durand de la Penne tried to persuade him to surface, and even gave him his own rebreather, but the seaman refused surfacing and died. Page 1016 – 1017: “Uomini della prima ora” – spring 1940 – before the mission G.A.1 failed dramatically. Luigi Durand de la Penne (3rd from left) together with the commanders of the 1st MAS Flotilla (Aloisi and Giorgini), surrounded by Stefanini, Bertozzi, Falcomatà, Tesei, Birindelli and Centurione. The second milestone in Luigi Durand de la Penne’s naval career was the sinking of the British battleship Valiant. In December 1941, he was one of the “fab six” (Emilio Bianchi, his co-pilot; Antonio Marceglia with Spartaco Schergat and Vincenzo Martellotta with Mario Marino) that attacked the Port of Alexandria. As a result, four ships were disabled: the British battleships HMS Queen Elizabeth and HMS Valiant, the oil tanker Sagona and the destroyer HMS Jervis. Luigi Durand de la Penne was awarded the M.O.V.M. (the Italian highest military decoration awarded for valour “in the face of the enemy”). At the end of the war, Admiral Charles Morgan (the Valiant’s Captain at the time of the attack in Alexandria) wanted to confer himself the medal to Luigi Durand de la Penne in a ceremony in Taranto. Page 122 – 123: Illustration of the mission G.A.3 on 18/19 December 1941 in the Port of Alexandria. After 8 September 1943, Luigi Durand de la Penne was offered the opportunity to be released from prison and fight for the Allies. 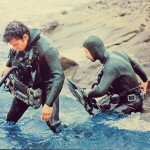 He accepted and returned to duty as a frogman. In June 1944, he participated in a joint Italian/British operation against the Germans (mission QWZ). A team of British and Italian divers sank the cruisers Gorizia and Bolzano before they could be used to block the harbour entrance. After the Second World War, Luigi Durand de la Penne stayed in the Marina Militare. He was promoted to Capitano di Fregata in 1950 and Capitano di Vascello in 1954. In 1956 he was appointed as Naval Attaché in Brazil. Luigi Durand de la Penne‘s family donated decorations he was awarded during his career, and his Panerai watch to the museum at the COMSUBIN headquarters in Varignano / La Spezia. 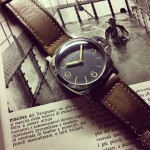 The Panerai watch, a Ref. 3646 / Type C with “Radiomir Panerai” dial has been recorded in our database in 2015. Enjoy reading more: Luigi Durand de la Penne M.O.V.M. is featured in chapter I (page 35), chapter II.I (page 94-123) and VIII.II (page 1016-1034) of our two “The References” books. Find information about the content of our book “The References” 1950’s-1960’s by using the “browse by tag” function. 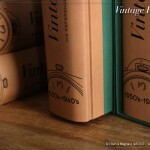 The tag 1392 is connected with all stories published about the second volume: watches, history, instruments and straps of the 1950’s-1960’s. 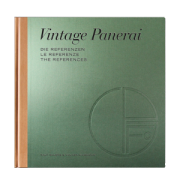 “The References” 1950’s-1960’s features numerous images and historic information on Vintage Panerai watches from the 1950’s to 1960’s. The References 6152 (chapter VI) and 6154 (chapter VII), are followed by Reference 6152/1 with the famous crown-protecting device are explained in detail and many variations in chapter VIII (a Ref. 6152/1 with Rolex movement and crown-protecting device can be seen in the photo on the left, see chapter VIII.II. 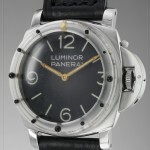 The watch is placed on a historic photo of a special tank made by Guido Panerai & Figlio, see also page 714). Followed by the Reference GPF 2/56 with Angelus movement (chapter IX), “The References” 1950’s-1960’s features in chapter X the Modified References 3646, Transitional 3646 and Modified Reference 6152/1. 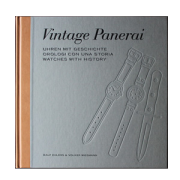 Chapter XI is about compasses and depth gauges, followed by the last chapter XII, an overview of the straps and buckles used on watches and instruments from Guido Panerai & Figlio in this era. In many respects, the GPF 2/56 set new standards in terms of design at Guido Panerai & Figlio: The casing diameter, now at a stately 60 mm (or 66 mm including the crown-protecting device), made the earlier Panerai watches with their 47 mm casings look small by comparison. This was also the first time a rotating bezel with five-minute increments was used, a luminous reference point at 12 o’clock and three other major indices at 15, 30 and 45 minutes. The inside of the rotating bezel is fixed securely to the casing and caseback with six screws at a distance of 60° on the underside. If the six screws are loosened, it is possible to lift off the caseback, the rotating bezel and the Plexiglas crystal from the watch casing. Unlike earlier Panerai watches, the caseback of the giant GPF 2/56 does not feature a thread but is fixed securely to the casing by the six screws. Compared to the Panerai watches used during the Second World War (bezel and caseback „twisted“ together by their internal thread onto the holding ring of the movement) as well as the watches produced in the 1950’s (bezel pressed onto the casing and caseback with external thread screwed onto the centre of the 47 mm casing). While the crown-protecting device was a very prominent, almost “superimposed” addition to the Reference 6152/1, and could only be integrated into the Rolex casing to a certain degree as a result of its construction, the GPF 2/56 clearly shows the “completely seamless integration” of the legendary crown-protecting device. The coffee table shot on the left shows page 1092 – 1093 in chapter IX.I of our book “The References” 1950’s-1960’s with a photo of the screwed caseback of a GPF 2/56 (left) and an illustration of the construction of the “kept together by six screws” GPF 2/56 (right). Enjoy reading! Another four weeks later, on 30 October 1940, he became the first SLC pilot to penetrate a heavily guarded enemy harbour with the new, secret weapon which still had to achive its initial and decisive proof of feasibility: the concept of attacking enemy ships in ports. Unnoticed, in the darkness of the night. Mission B.G.2, even without the success of damaging or sinking an enemy ship, marked the start of a three-year war that took place noiselessly underwater in the Bay of Gibraltar. However, for Gino Birindelli, mission B.G.2 marked the start of a journey through Allied POW camps that would last until early 1944. In his memoirs Gino Birindelli M.O.V.M. 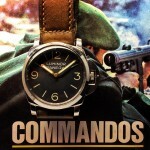 wrote a remarkable sentence: “I could clearly see my left wrist with the big Radiomir watch we used during the action and I saw how the hand moved, time was passing…” In his personal story this was just a very little side note, but it underlined clearly the importance of the waterproof, luminous and reliable Panerai watch he and the men of the Mezzi d’Assalto of the Royal Italian Navy were trusting during their action. Page 1018 – 1019: The inventors of the SLC, Teseo Tesei and Elios Toschi, together with the first crews which instigated the legendary “Spirito del Serchio” at their secret base at Bocca di Serchio in June 1940 – Gino Birindelli was one of them. Page 1026 – 1027: The progress of Mission B.G.2 against the port of Gibraltar in the night from 29 to 30 October 1940. The transport submarine Scirè, commanded by Junio Valerio Borghese, penetrated the Bay of Gibraltar, from where the three SLC teams started their approach. Page 1012 – 1013: A view inside Birindelli’s Ref. 6152/1 with crown-protecting device and Rolex movement. The watch was auctioned at Sotheby’s in May 2014. 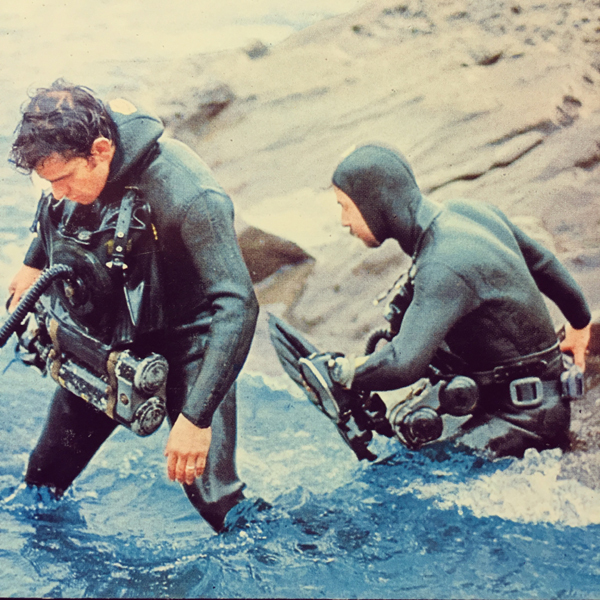 In his function as a two-time commander of the “Raggruppamento Subacquei ed Incursori Teseo Tesei” special unit, Gino Birindelli was one of the men who passed on his experiences to the next generation of the naval special unit. When selecting the instruments for the COMSUBIN incursori, watches from Guido Panerai & Figlio were the first choice, even after the Second World War. 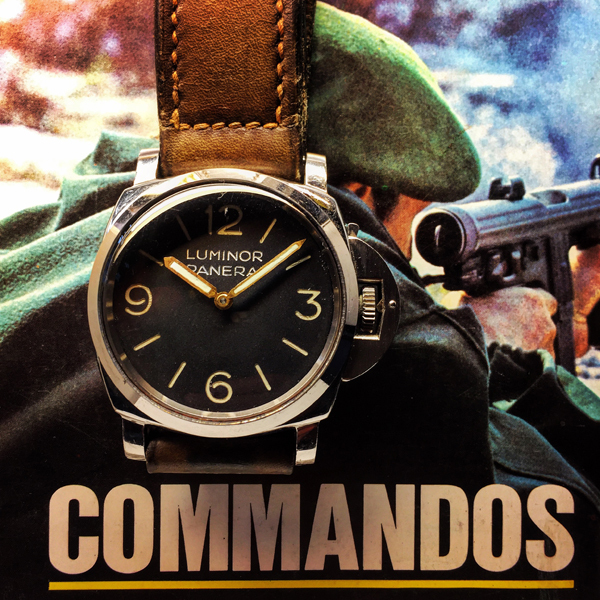 The fact that Birindelli still possessed a Panerai watch from the era even years after his commando activities whit the COMSUBIN shows the significance and symbolism of a Panerai watch, which must surely have been a sign of military tradition, a menento and a sign of appreciation. The watch of Admiral Gino Birindelli (1911 – 2008) and the unique story behind his career being Comandante 1a Divisione Navale, Comandante in Capo della Squadra Navale and Comandante Nave Alleato del Sud Europa can be read in the book “The References” 1950’s-1960’s (chapter VIII.II, page 1006 to 1043). Read more on Gino Birindelli also here. Enjoy reading!